The model PCB-900WC is a tough, comfortable, folding chair. It features everything you'd expect to find on a normal wheelchair, but beefed up and ready for work! We stock two seat widths to choose from for same or following day shipping. The Model 926L and 928L comes with standard foot rests, 26" or 28" seat width, 18" seat depth and full length removable arms that are height adjustable with screw attached stainless steel clothing guards. Back heights are 16" from seat to top of the back. 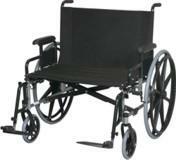 All wheelchairs have black upholstery and black frame. The PCB-900XL Series has a weight capacity of 700 lbs. We stock three seat widths (26", 28" & 30") to choose from for same or following day shipping. Each comes with a pair of standard foot rests, 20" seat depth and full length removable arms that are height adjustable with screw attached stainless steel clothing guards. Back heights are 18" from seat to top of the back. 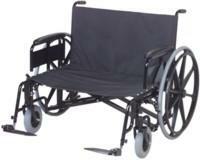 All wheelchairs have black upholstery and black frame. Made in the USA.